The retina is the light-sensitive layer of nerve tissue that lines the inside of the eye and sends visual messages through the optic nerve to the brain. 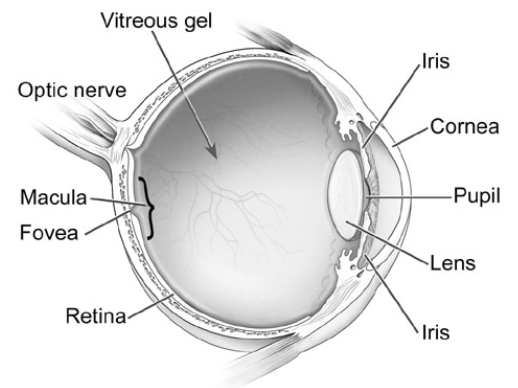 A retinal detachment occurs when the retina becomes separated from the rest of the layers of the eye. This usually occurs after you develop a tear in the retina. The extent of permanent damage depends on how much of the retina becomes detached and whether or not the center of the retina (the macula) becomes detached. The macula is made up of special nerve cells that provide the sharp central vision needed for seeing fine detail (reading and driving etc.). If your macula has become detached, you have a poorer visual prognosis and you may not regain good enough vision to read or drive with that eye even after successful surgery. Why do I have a Retinal Detachment? What are the symptoms? A retinal detachment occurs when a tear forms in the retina allowing fluid to get under the retina forming a detachment. They are more common in patients who are very near- sighted, have a family history of retinal detachment, and in eyes that have had prior trauma or eye surgery. Patients often complain of flashes, new floaters and a shadow forming in their vision when a retinal detachment occurs. We are able to detect a retinal detachment during an eye examination. Your surgeon will carefully examine your eye to identify all the retinal tears and determine the extent of the retinal detachment. He may need to press on your eye to examine your retina fully. He will then discuss with you an appropriate surgical plan to most safely and effectively reattach your retina. Although a majority of our patients experience an improvement in vision after surgery, there are a small percentage of patients who do not have improved vision even after successful and uncomplicated surgery. When the retina becomes detached, some amount of retinal nerve damage will occur that is permanent. Your final visual outcome will depend on how much nerve damage occurred with your retinal detachment. Your vision after surgery will likely be worse if your macula has become detached. The biggest reason for failure of retinal detachment surgery is the formation of scar tissue that redetaches the retina (proliferative vitreoretinopathy). The highest risk of redetachment is within the first 3 months following surgery. We will monitor carefully for this during your postoperative visits. You need to keep in mind that our goal is to maximize the vision in your affected eye. A retinal detachment is a very serious and potentially blinding condition. Even after successful surgery, your vision will likely never be as good as it was prior to your retinal detachment. Your retinal detachment surgery will likely involve a scleral buckling and/or vitrectomy procedure. We use the most advanced surgical equipment and techniques available for retinal detachment surgery. A scleral buckling surgery involves positioning a silicone band around your eye beneath your eye muscles to bring in the walls of your eye. This elongates your eye and makes you more nearsighted. A vitrectomy surgery involves making 3 holes in the eye and using instruments to remove the jelly-like substance (the vitreous humor) that normally fills the center of the eye. The removal of the vitreous inside the eye does not cause any permanent harm. The vitreous is replaced by natural fluid produced inside the eye. The retina is then reattached and all retinal tears surrounded by laser. The eye is then filled with an inert gas to keep the retina in position as it heals. The gas bubble will dissipate from your eye within 4-6 weeks. You cannot change elevation (fly on an airplane) or undergo general anesthesia with nitrous oxide gas while a gas bubble is in your eye. We will place a green bracelet around your wrist indicating this after surgery, do not take off the bracelet until the gas dissipates from your eye. In certain cases we may use silicone oil instead of gas; your surgeon will review with you if this is appropriate for your surgery. Retinal reattachment surgery usually takes one-two hours to perform. It is typically performed the under local anesthesia so that you are awake and comfortable during the procedure and have minimal complications from anesthesia postoperatively. If you are awake, it is very important for you stay still during surgery. After the surgery you will have an eye shield placed on your eye. Do not remove this shield until we see you in the clinic the following day when we will remove it for you. You will be given instructions on which eye drops to use and all your restrictions at this time. You do not need to use any eye drops the night after your surgery. Please bring all your eye drops to your first postoperative visit. Most patients have some discomfort after surgery. If you have some pain we recommend you take Acetaminophen (Tylenol). Avoid Aspirin or Ibuprofen as this can increase your risk of bleeding. You may need to position your head in a certain position after surgery. Your surgeon will review appropriate head positioning with you and your family members after surgery. The positioning will depend on where your retinal tear(s) are. It is very important that you position as instructed or your retina will be at a higher risk of redetaching.